England v NZ: Can England defy logic and beat All Blacks? Coverage: Live commentary on BBC Radio 5 live, online, mobile and the BBC Sport app, plus live text commentary on the BBC Sport website. Highlights on BBC Three at 19:00 on Saturday. 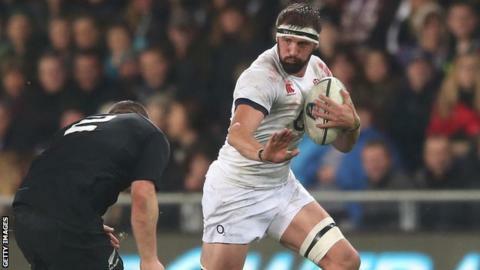 For England to beat New Zealand on Saturday, they must not just defeat 15 men but also logic, precedent and expectation. You think that's hyperbole or a cruel lack of faith? The men in black have lost only twice in 46 Tests since the start of the last World Cup. They have 1,023 caps in their match-day squad to England's 437. The men in white are missing six British Lions from their pack, have a debutant on one wing and a centre partnership that has never played together before. Under Stuart Lancaster, England have only won two of their 11 matches against the three southern hemisphere heavyweights of New Zealand, South Africa and Australia. Since the beginning of 2012 the All Blacks have scored an average of 31.5 points per game; England 24. Intimidating? Maybe. But maybe, just maybe, self-belief and raw promise and some unholy coming together of atmosphere and occasion and ability can surmount it all. Maybe. "Regardless of whether they've carried the title of world champions, the All Blacks have always carried the aura of being the benchmark," admits flanker Tom Wood. "It's is always the big game for us. South Africa and Australia pose formidable challenges, but there is something special about the All Blacks. "But intimidating isn't a word we'd admit to using. They have a very well balanced game, but I've played them a number of times now and you quickly realise that they're still human." World Cup winning coach Clive Woodward, characteristically, had his own idiosyncratic way of trying to puncture that famous All Blacks aura: never refer to them as that. New Zealand they were when England beat them in the corresponding autumn international of 12 years ago and then again, on enemy territory, eight months later. There is less quirkiness this time around, even if the burden of only one win in the 11 years of contests since still weighs heavy on these young shoulders. "My first rugby memory was watching Jonah Lomu, thinking, 'I want to be like that'," admits winger Jonny May, who will come up against the fearsome might of the modern-day Lomu, Julian Savea, on Saturday afternoon. "England are my team, but if there was any other team I was going to watch, it was always the All Blacks. And I wanted to watch them dominate. "But you take confidence in yourself, and I look around our squad and think, Jeez, we've got some great players in our squad. And then I think how close we came a couple of times in the summer." And close it was, at least at times. While the series in New Zealand was lost 3-0, only a late score denied England in the first Test before a late rally took them to within a point in the second. The third? It's probably best not talking about the third, not unless you want intimidation to take over again. "We respect their strengths and trends in their game," says Wood, whose Kiwi wife ensures that his three children own both England and All Blacks shirts, even if he insists that their loyalty ultimately lies with Dad. "But we know from playing them that we're not only capable of beating them, but also that we've dominated them for long periods of those games. "The trick to beating New Zealand is concentration. Because as soon as they smell blood they are so quick to respond. "We've been in games where we've conceded 15 or 17 points in the blink of an eye. They haven't dominated us in the game. They haven't built a score. They've just flipped a switch and had the game won. "Three tries in the second Test in Dunedin when we had a 10-minute quiet spell; the opening 10 minutes at Twickenham last year, even when we beat them in 2012. "We feel more than their equal in periods of play. It's just making sure you don't switch off, because the moment you do they've got you. And they're so good, so clinical, at turning up the heat in those periods." With just 357 afternoons between Saturday and Twickenham's World Cup final, this match is being billed as the ultimate test of England's credentials. This is the time to prove yourself potential champions, goes the established theory. Sometimes history has borne that out. England's World Cup-winning form was clearly evident in the autumn before their 2003 triumph, with New Zealand, Australia and South Africa all put to the sword at Twickenham as Woodward's men piled up 116 points on those three successive Saturdays. So too did the side seem set. Of the 15 who started against New Zealand in November 2002, 12 would start the World Cup final a year later. Two more of those starters were on the bench. At other times the auguries are less clear-cut. A year before reaching the 2007 World Cup final, England were taking a horrible autumn pasting from New Zealand, South Africa and Argentina. Of the 15 that suffered a record home loss to the All Blacks, only a third would still be in white when the campaign reached its climax at the Stade de France. Then you have Wales, victorious only twice in 12 games in 2010, yet only a long-range Leigh Halfpenny penalty away from the World Cup final the following autumn. What you can say about World Cup winners is that they tend to have mountains of experience - 636 caps in the All Blacks side that triumphed three years ago, 602 in the Springboks' world champions of 2007, 565 in England's class of 2003. In England's starting XV on Saturday there will be just 360. And that, for all the excitement about the debut of Fiji-born winger Semesa Rokoduguni, will leave many in the sell-out Twickenham crowd apprehensive about what the 80 minutes might bring. "Against New Zealand it can be physical or mental fatigue from the pressures of the day or the occasion that get to you," admits Wood. "Sometimes you're over-keen, and you over-commit to one element of the game. Racing round the corner looking to make big hits, and they catch you on the short side. "But generally it's momentum. You make an error, they get a sniff, in order to recover from that error you make another. Because you're stretching, looking to do something off-script because you feel like you have to force it." For a winger like May, who loves to play on instinct, to run to his own mazy rhythms, that brings its own unique pressures. Lancaster wants his side to play with attacking freedom. But where do you strike the balance when you're playing a side who will strip you of the ball if you're isolated, who will turn you with pin-point kicking, who will send 16-stone Savea hammering at you at every opportunity? "Your nerves and energy go through the roof playing international rugby," says May. "And that draws you back to what you're most comfortable doing, which for me is going for it. "Shape and organisation is a great thing, because it gives you options. The ball-carrier might have someone coming up short, someone up the back, someone up the inside. He's got those three decisions, and I can read off those - where is the space, how can I get to that space, can I get the ball? "Within organisation comes that instinctive decision. Clear head, playing what's in front of me. "I'll be at my best when I'm playing instinctively, reading what's in front of me. You don't have time to think." Should May and his team-mates beat that intimidation, beat those odds, and find themselves leading with match almost spent, there can still be no release. From Dan Carter's drop-goal against Ireland in 2012 to Ryan Crotty's try in Dublin a year later, from Conrad Smith's try in the first Test this summer to Malakai Fekitoa's converted try against Australia last month, the All Blacks have made a habit of stealing victory at the death. "Sometimes it's physical fitness," says Wood. "Sometimes it's belief - they know they will come good, even if they're five points down in the final seconds. And there's an inevitability for the opposition, who start to panic. "You might stop playing, because you feel you have to protect a six-point lead. How do you do that? You either give them the ball back, by kicking it deep into their half, where they run it back with pressure. Or you keep the ball, but keep it in your half, where you risk giving penalties away. "They believe, and the opponents often have that little moment of insecurity or panic. And that's the difference. They believe." Is Savea better than Lomu? Read more on England v New Zealand: Is Julian Savea better than Jonah Lomu?